Emma Jane came to my attention in the summer of 2012 when the song ‘Sunday Monday Blues’ ascended to ‘track of the summer’ status. The subsequent years have seen her music flicker in and out, but now that is set to change with the release of a truly outstanding record, simply titled TREASURES. If there is a more distinguishable album released this year from a solo UK based artist then it will have to be very good to topple this gem. For this is a record that takes little time to find its way and successfully steers the listener through a minefield of emotion. Deeply personal and sourced from a ripped open heart makes the sort of music that resonates well here. Emma Jane has succeeded on multiple levels in making a record diverse in sound yet consistent in quality. A powerful vocal set is used to an optimum level across the eleven tracks as the small team assembled to support Emma Jane set out on a journey to bring her original composed songs to life. Stopover sounds include rock, pop, soul, jazz, country et al, making genre association impossible. Not a bad open place to be, although you can never underestimate the value of promotional tags. UK Americana feels right in spasms, but not to the core, even if the content blows away most of the opposition in that camp. Labels aside, let us explore the peaks and summits that have made TREASURES an album to cherish. A strong theme and inspiration across the album is the onset of personally family experienced dementia and its associated effects, presence and impact. The writing is in a subtle way as to allow the listener room for self-interpretation. Darkness mixes with light alongside hope in a mist of melancholy. Above all, the tunes are well-crafted efforts engaging the listener from the outset, even to the extent of steering them down an undulating path. The album is bookended by two similarly slow pensive tracks, opening and closing the door on proceedings. The minimalist gospel-like opener ‘Where I’m Going’ sets the scene resolutely, framed by the explicit lines ‘the mind gives up or the body retires/once full of life but now I’m so tired’. Forty-five minutes later Emma Jane conquers the piano ballad world with the painfully, or maybe not, conclusive, ‘Drink You Away’. If pressed for the moment when the record rides the crest of a wave, then the country leaning ‘Dreaming About You’ fits the bill. This feel good story song of unrelenting love is awash with classy guitar twang and a chorus that projects it to the peak. This is far from a country album on the surface, but scratch a little deeper and a substance emerges. Pushing this track hard in the hooks galore gallery is the soulful ‘Breathe Slow’, a tip for us all sometimes. On the topic of tracks reaching out in the promotional sphere, ‘Paper Houses’ with its rock ‘n’ pop sentiment does a grand vibrant job. All while contemplating the metaphor ‘paper’ does not really equate to a great substance. It is rather a breathless merry go round of sounds in the opening phase. ‘Lover Man’ with its piano opening strays into jazzy territory, while ‘In My Days’ is a straight up acoustically driven rock ‘n’ roller looking back in time and ensuring a dose of repetition in a song works wonders. Three tracks, namely ‘Close’, ‘Don’t Settle’ and ‘Treasures’ fall into a rockier sounding realm. The former builds up slowly before Emma Jane ramps up the vocals into full-on mode. Always done tastefully, mind you. The latter of this trio acts as the upbeat climax to the record, just before we crash out in an alcohol haze. ‘Beyond the Rainbow’ completes the track listings and its popular appeal grows out of a well-constructed base. The eternally seeking title appears only in a first verse line as the cry of ‘Don’t Let Me Go’ resonates strongly at the end. Strength is a feeling that emanates throughout from the vocal adaptations to the musical templates that house the songs. The hopscotch sounds are brought together in a common bond sourced from the inspiration. Emma Jane leads, and the listener is compelled to follow. An artist can ask no more than make a record that the listener believes in. 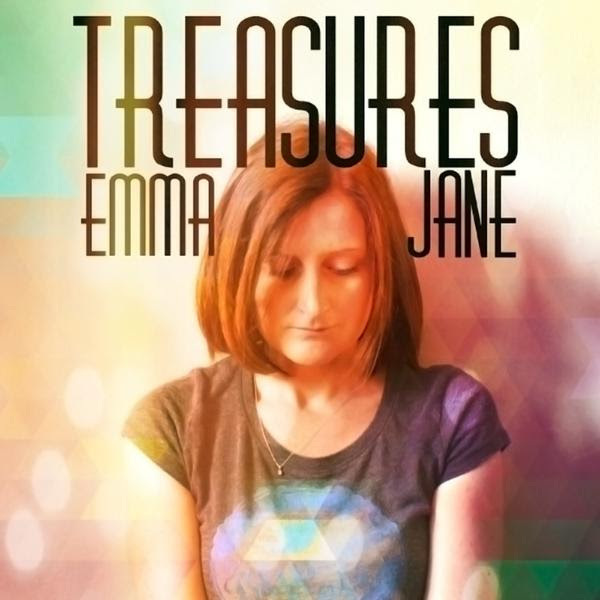 TREASURES has done that and the music of Emma Jane is destined to not merely flicker on the horizon anymore.